The last few years have seen great strides being made in 3D printing, with applications not only on Earth but also for space. 3D printing can be used for manufacturing smaller objects and equipment and even for constructing buildings. Not only can you create things on site and on demand, instead of bringing all structures, you can even use local materials if you are on the surface of a moon, Mars or an asteroid. Currently, there are many concepts of 3D printed space dwellings, including a lunar base by ESA and Foster + Partners as well as the NASA Mars 3D printing contest that generated 165 entries. One of the first designs using this idea was SinterHab. 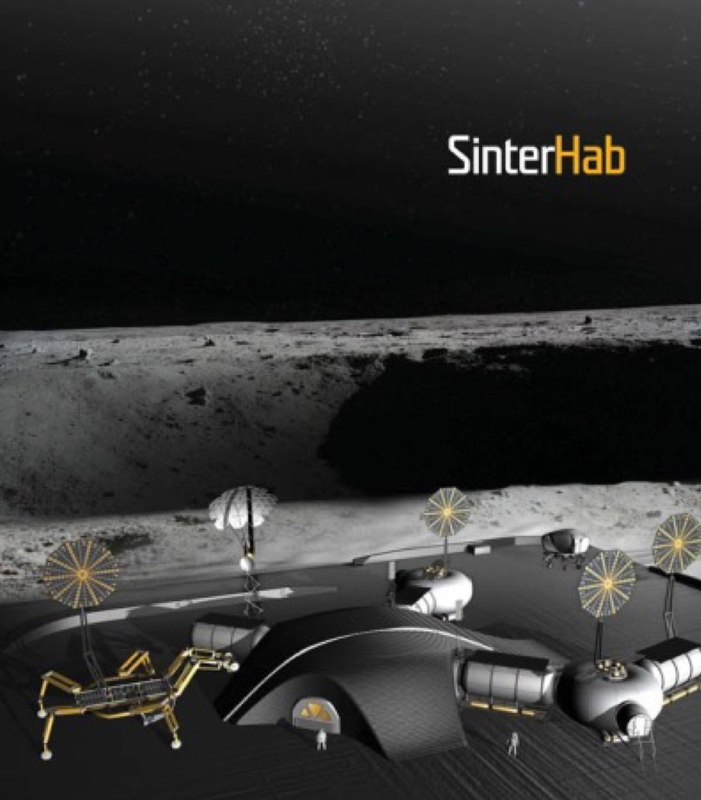 This concept envisions a 3D printed lunar habitat module for a base on the Lunar South Pole, occupied by 4-8 people and equipped with a bio-regenerative life support system. It would be constructed utilizing both additive contour crafting technologies and the sinter properties of the local lunar dust (regolith). The construction would be partially automatic, using NASA’s ATHLETE rover, continuously delivering the regolith in layers and then sintering it using microwaves. Sintering is the same process as when ceramics is solidifying and fusing together without melting. Microwave sintering uses solar power to create microwaves that heat the regolith to 1200–1500 °C. The resulting material has a high compressive but low tensile strength. You can also sinter parts of the surrounding ground to get rid of the loose and very abrasive lunar dust. A benefit of using the local lunar dust is that you can make thicker walls than if you have to bring the material from Earth. The cover protects you from radiation and micrometeoroids, a matter of life and death when you don’t have the protective atmosphere and magnetic field we are enjoying on Earth. The interior would be coated with a layer of inflatable membranes derived from the TransHab and brought from Earth. The volume is pressurised with breathable air for the astronauts to live and work in, and also provides a wall liner with a smoother texture than the concrete like outer wall. Nature provides inspiration for the floor plan of the inflatable structures in the form the geometry of foam bubbles, where the forces of neighbouring bubbles are in equilibrium and enable the building of flat walls. The outer walls are round, the best shape for a pressurised volume in the vacuum environment of the moon. SinterHab has two garden modules where food is produced, rather than bringing all edibles from Earth, in line with the locally manufactured structure. The garden also plays a part in waste and water recycling, as well as air revitalisation – the life support system that keeps the astronauts alive. Developments in this area are relevant also for resource and material management on Earth. 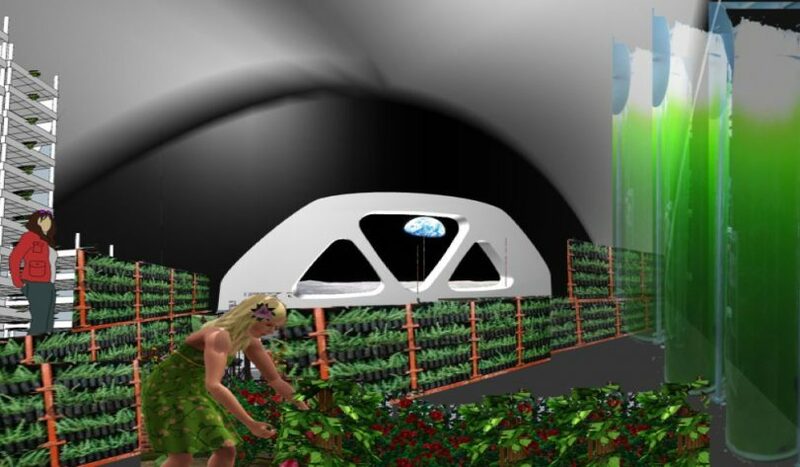 There is a “green garden buffer” on the way from the living module to the lab and working module, creating a sensation of going through the outdoors. This section also includes a window overlooking the lunar surface. Plants and nature have proven to be important for wellbeing, especially in otherwise stressful conditions. Due to the pressure difference, radiation and micrometeoroids, windows are a weak point in the structure and therefore this is the only window in the base despite the benefits of windows for astronauts. 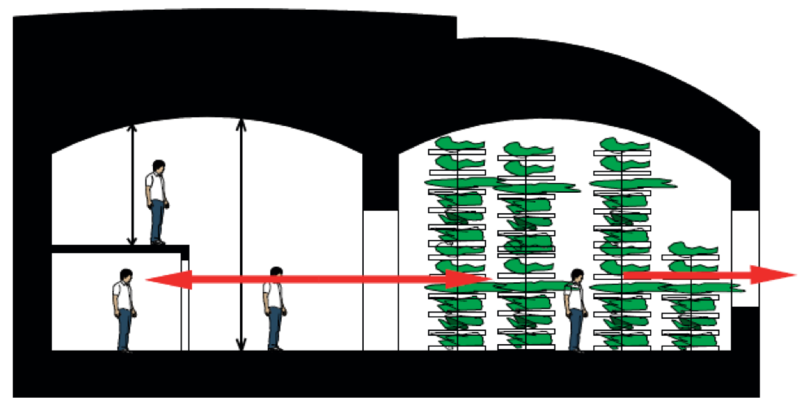 SinterHab’s green garden buffer: conceptual visualisation of the greenhouse/garden (left) and section (right) showing the living space with two different ceiling heights and the line of sight from the living space through the garden and the view out the window. More generally, 3D printing capabilities also means that you no longer have to ship replacement parts and other equipment, but can make them on-demand. On ISS, in orbit around Earth, this is useful enough (and has been proven to work), but when it comes to travelling to the moon or even Mars, making new things as you go means that you don’t have to pack everything you might need from the start and that your equipment can last much longer since you can create replacement parts. You would only need to bring the 3D printer and the material, or even use the local materials. Even the blue prints can be created as you go, or be sent from Earth on-demand. *Project SinterHab was initiated at the International Space University by ESTEE space architects Tomas Rousek, Katarina Eriksson and Dr. Ondrej Doule at Space Innovations in 2010.